Adenovirus Functional Titer Immunoassay Kit | Cell Biolabs, Inc. Accurate measurement of adenovirus titer is critical for gene delivery. Traditional plaque-forming unit (PFU) assays are long and suffer from high inter-assay variability. The QuickTiter™ Adenovirus Titer Immunoassay Kit provide a quick, complete system to functionally titer virus infectivity. The assay recognizes all 41 serotypes of adenovirus, and can be used with any adenovirus system that can amplify in HEK 293 cells. Figure 1: ICC Staining with the QuickTiter™ Adenovirus Titer Immunoassay Kit. HEK 293AD cells (#AD-100) were infected with different dilutions of purified Ad-ß-Galactosidease (#ADV-002) for 48 hours. Immunostaining was performed according to the assay protocol. X-gal staining was performed with the ß-Galactosidase Staining Kit (#AKR-100). Keshava, S. et al. (2016). Intrapleural adenoviral-mediated endothelial cell protein C receptor gene transfer suppresses the progression of malignant pleural mesothelioma in a mouse model. Sci. Rep. 6:36829. Xiong, X. et al. (2016). SIRT6 protects against palmitate-induced pancreatic ß-cell dysfunction and apoptosis. J. Endocrinol. 231:159-165. Lokhandwala, S. et al. (2016). Induction of robust immune responses in swine using a cocktail of adenovirus-vectored african swine fever virus antigens. Clin Vaccine Immunol.doi:10.1128/CVI.00395-16. Ansari, S. A. et al. (2016). The role of putative phosphatidylserine-interactive residues of tissue factor on its coagulant activity at the cell surface. PLoS One. doi:10.1371/journal.pone.0158377. Martin, L. J. & Wong, W. (2016). 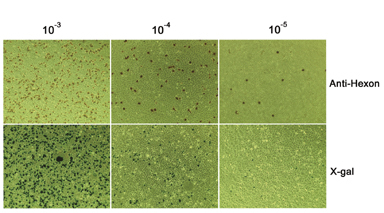 Enforced DNA repair enzymes rescue neurons from apoptosis induced by target deprivation and axotomy in mouse models of neurodegeneration. Mech Ageing Dev. doi:10.1016/j.mad.2016.06.011. Gibot, L. et al. (2015). Cell-based approach for 3D reconstruction of lymphatic capillaries in vitro reveals distinct functions of HGF and VEGF-C in lymphangiogenesis. Biomaterials. doi:10.1016/j.biomaterials.2015.11.027. Herath, S. et al. (2015). Analysis of T cell responses to chimpanzee adenovirus vectors encoding HIV gag–pol–nef antigen. Vaccine. doi:10.1016/j.vaccine.2015.10.111. Yang, Y. et al. (2015). RGD-modifided oncolytic adenovirus exhibited potent cytotoxic effect on CAR-negative bladder cancer-initiating cells. Cell Death Dis.6:e1760. Nakao, S. et al. (2015). Stimulus-dependent regulation of nuclear Ca 2+ signaling in cardiomyocytes: a role of neuronal calcium sensor-1. PLoS One. 10:e0125050. Patsouris, D. et al. (2014). Insulin resistance is associated with MCP1-mediated macrophage accumulation in skeletal muscle in mice and humans. PLoS One. 9:e110653. Xiong, Y. et al. (2014). Long term exposure to L-arginine accelerates endothelial cell senescence through arginase-II and S6K1 signaling. Aging (Albany NY). 6:369. Barrett. A. et al. (2014). A crucial role for DOK1 in PDGF-BB-stimulated glioma cell invasion through p130Cas and Rap1 signalling. J Cell Sci. 127:2647-2658. Wilkins, H. et al. (2013). Mitochondrial Glutathione Transport Is a Key Determinant of Neuronal Susceptibility to Oxidative and Nitrosative Stress. J. Biol. Chem. 288:5091-5101. Scallan, C. et al. (2013). An Adenovirus-Based Vaccine with a Double-Stranded RNA Adjuvant Protects Mice and Ferrets against H5N1 Avian Influenza in Oral Delivery Models. Clin. Vaccine Immunol. 20:85-94. Xiong, X. et al. (2012). The Autophagy-related Gene 14 (Atg14) Is Regulated by Forkhead Box O Transcription Factors and Circadian Rhythms and Plays a Critical Role in Hepatic Autophagy and Lipid Metabolism. J. Biol. Chem. 287: 39107-39114. Haidar, M. et al. (2012). Integrin α2β1 Mediates Tyrosine Phosphorylation of Vascular Endothelial Cadherin Induced by Invasive Breast Cancer Cells. J. Biol. Chem. 287: 32981-32992. Hisamitsu, T. et al. (2012). Na+/H+ Exchanger 1 Directly Binds to Calcineurin A and Activates Downstream NFAT Signaling, Leading to Cardiomyocyte Hypertrophy. Mol.Cell Biol. 32:3265-3280. Lee, S. et al. (2012). Adiponectin Abates Diabetes-Induced Endothelial Dysfunction by Suppressing Oxidative Stress, Adhesion Molecules, and Inflammation in Type 2 Diabetic Mice. Am J Heart Circ Physiol. 303: H106-H115. Polling, J. et al. (2011). Induction of Smooth Muscle Cell Migration during Arteriogenesis is Mediated by Rap 2. Arterioscler Thromb Vasc Biol 31:2297-2305. Triulzi, C. et al. (2010). Antibody-Dependent Natural Killer Cell-Mediated Cytotoxicity Engendered by a Kinase-Inactive Human HER2 Adenovirus-Based Vaccination Mediates Resistance to Breast Tumors. Cancer Res. 70:7431-7441. Sen, P. et al. (2010). Zinc Modulates the Interaction of Protein C and Activated Protein C with Endothelial Cell Protein C Receptor. J. Biol. Chem. 285:20410-20420. Troidl, K. et al. (2009). Actin-binding Rho activating protein (Abra) is Essential for Fluid Shear Stress-Induced Arteriogenesis. Arterioscler. Thromb. Vasc. Biol. 10.1161/ATVBAHA.109.195305. Peled, M. et al. (2009). Systemic Administration of a Conditionally Replicating Adenovirus, Targeted to Angiogenesis, Reduced Lung Metastases Burden in Cotton Rats. Clin. Cancer Res. 15:1664-1673. Soesanto, Y. et al. (2008). Regulation of Akt Signaling by OGlcNAc by euglycemia. Am J. Physiol. Endocrinol. Metab. 295:E974-E980. Black, S.A. et al. (2008). TGFß1 Stimulates Connective Tissue Growth Factor (CCN2/CTGF) Expression in Human Gingival Fibroblasts Through a RhoA-Independent, Rac1/Cdc42-Dependent Mechanism: Statins with Forskolin Block TGFß1-induced CCN2/CTGF Expression. J. Biol. Chem. 283:10835-10847.